If you've ever physically spliced two pieces of film together you know how magical the 24 fps frame cadence is. I don't know if there is a psychometric test that can confirm this, but it seems like the images linger just long enough to make a lasting impression, while maintaining the proper motion of objects. When Sony 24p cameras were first used to shoot a feature it was clear that a new age of cinema was upon us. In today's article I am going to detail a low cost workflow that will allow you to shoot high definition video at 24 fps. This workflow employs the tools detailed in my previous workflow article. To recap, it relies on a low cost HDV camera (the Canon HV20) and a low cost post production environment (Adobe Creative Suite 3). There are two reasons why HDV was selected for the video format: camera cost and disk space requirement. When it comes to cost per pixel, HDV cameras cannot be beat. HDV is considered a consumer format and as a result the cameras are a fraction of the cost of DVCPro HD gear. In regard to disk space, you'll find that the 25 Mbps data rate of HDV allows you to squeeze 5,000 minutes of footage onto an entry level PC with a terabyte of storage. The DVCPro HD format, on the other hand, eats up to four times the disk space and also requires greater disk throughput (which means your disk subsystem needs to be gold plated). Don't get me wrong, we're not against professional gear here at Free Film School, we just want to define an affordable option for filmmakers that aren't sitting on a big pile of cash. Let's begin with your camera set-up. Though the two icons are nearly identical, the Cine Mode setting plays some tricks with your aperture and shutter speed that you want to avoid. My recommendation is to shoot in HDV 24p without any additional in-camera effects (like Cine Mode). Next you need to make sure that you are shooting with the highest shutter speed available. When the camera is in Camera mode click on the Func. button on the back of the camera to bring up the camera settings. The top item in the list is shutter speed (Shutter-Prio.AE). Click on the item to see the shutter speed choices and from the choices select "TV". This will set a fast shutter speed which will help make your images crisp and clear. A slower shutter would brighten up your images, but that is exactly what we want to avoid. The ugliest thing about video is the blow out that is common with bright images. We want to capture all the image data we can (not blow it out). So we'll use a fast shutter and correct the white levels in post. Next you'll need to knock down the exposure level a couple stops (another way to avoid blow outs). With the camera in Camera mode click on the Set button at the back of the camera to bring up the manual controls. The Set button has a torturous method for getting into exposure mode which I'll let you figure out for yourself. Once you are in the exposure mode click the exposure down until the image in your viewfinder is crisp and clear. It's OK for the image to get dark. What you are trying to do is tame the sections of your image that are too bright for the DIGIC DV II image processor to handle. Level set for the bright sections of your image (even if the rest of the image now looks darker than you'd like). Don't worry, white levels are easy to fix in post, but if you blow out your image there won't be anything there to fix. Now go out and shoot. I'll wait here till you're ready to edit. Are you done shooting yet? Geez, I just about finished knitting you a scarf. Now you need to transfer all your footage to the PC. Make sure the camera is set to output HDV and not DV. You'll find that Adobe Premiere is great at capturing HDV, but for some reason the HD capture tool that comes with Windows Vista Ultimate (Windows Movie Maker HD) can only capture DV. And even that feat cannot be accomplished until you've installed a number of third party codecs. 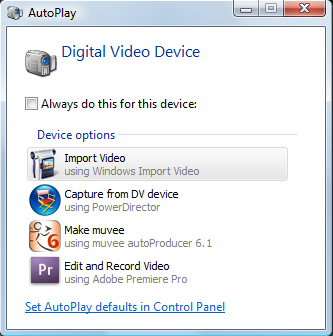 So if you see an automatic pop-up window appear when you connect your camera to your PC make sure you do not pick the default choice "Import Video using Windows Import Video", that would be disasterous. Instead select "Edit and Record Video using Adobe Premiere Pro". Choosing the "Adobe Premiere Pro" option throws you into the intro screen for the product where you are asked to either open an existing project or create a new one. 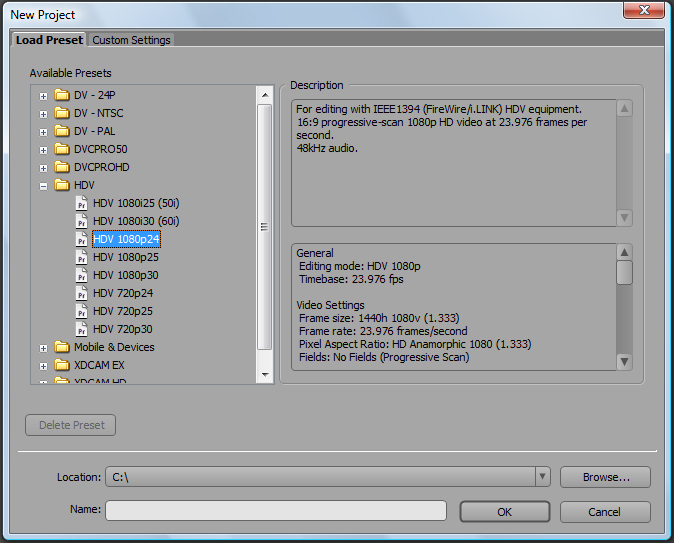 Create a new project and load the "HDV 1080p24" preset from the "Load Preset" tab. Once the preset loads, Adobe forgets why you opened Premiere in the first place and just sits there. Select File > Capture to open the capture window. Can't Activate Recorder, Try Resetting Camera. If you get this message either you failed to load an HDV preset when you opened your project or the camera is not in the HDV output mode. Make sure that you actually shot in HDV, that your camera is set to output HDV and that your Adobe Premiere Pro project is loaded with the correct HDV preset. Once you get past this error the capture process is a trivial affair (simply click the red record button in the interface). Once you are done with the capture process the first thing you'll notice about your files is that Premiere does not think they are 24 fps. Premiere says they are 1440x1080 at 29.97 fps and Premiere is correct in this regard. Because of the way the HDV standard was implemented by all parties involved your 24 fps video is actually stored in a 29.97 fps wrapper on disk. It's as if 3:2 pulldown was added to your content. To fix this problem you will have to remove the 3:2 pulldown. 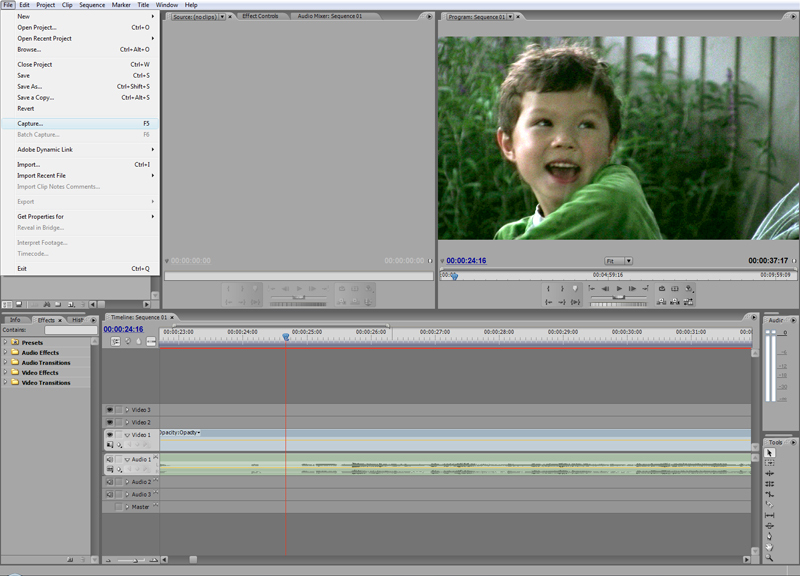 Luckily the Adobe Creative Suite comes with an incredible tool for doing this called "Interpret Footage". The full version of the tool can be found in Adobe After Effects, while a neutered version of the tool can be found in Adobe Premiere Pro. Since we have to correct white levels in After Effects anyway we might as well use that version of the tool. So now you'll need to close down Premiere, open After Effects and import all your footage into that environment. Once your assets are included in your After Effects project you can select an asset and then click on File > Interpret Footage > Main and the "Interpret Footage" tool appears. This tool will get your video out of the 29.97 fps shell that it's stuck in. Simply click the "Guess 3:2 Pulldown" button and the tool will find the original 23.976 frame cadence in the file that you have submitted. The tool is a little confusing in that it says "Conform to frame rate: 29.97" but simply ignore that. Down in the "Fields and Pulldown" section there is another message that says "Effective framerate of 23.976 ftps" and that is the message that matters. You have now converted your 29.97 fps file to 23.976 fps. Click "OK" to return to the main menu and then repeat this action for each of your clips. This is the superior method of converting Canon HV20 output to 23.976 fps. There is an inferior method that you might stumble upon by accident. 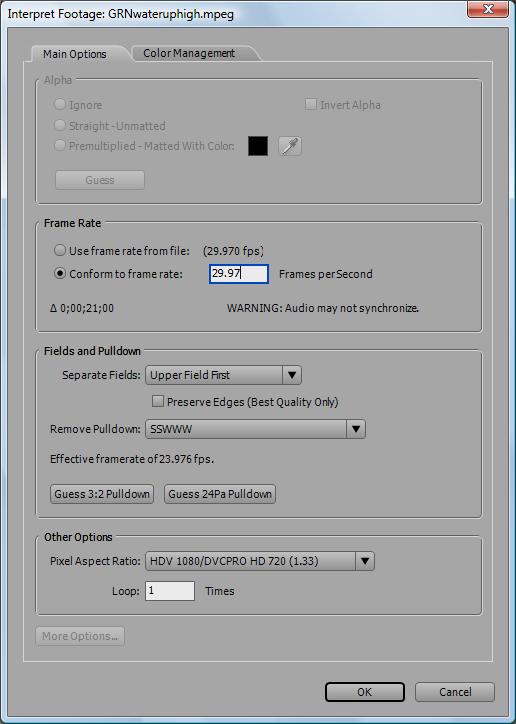 If you fail to interpret your footage, when you go to output a movie from your Premiere project (after editing is complete) you can force Premiere to produce a 23.976 fps movie. This process, however, will clumsily remove frames to get to the 23.976 fps goal, and the result will be noticeably jerky. The original footage was shot in HDV at 24p with a TV-speed shutter. It was under-exposed 2-3 stops to avoid blow outs. The footage was then captured to disk where it was stored in a 29.97 fps shell (i.e. 3:2 pulldown was added). In post the captured footage had the 3:2 pulldown removed (getting it back to 23.976 fps). White and gamma levels were then bumped up to compensate for the under exposure. I hope you like the workflow as it stands now. At this point you have some gorgeous 23.976 fps footage and you never even had to wind a Bolex once. I wanted to answer a question that I received from a reader about burning a DVD with 24p content. The reader wanted to know whether or not you actually have to add the 3:2 pulldown back in for the DVD version (and if so, why even shoot in 24p in the first place)? I guess one good reason to shoot in 24p (other than the aesthetic quality) is that with your 24p master you can make a much better YouTube encode that you could make with a 29.97 fps master. YouTube may not be the final destination for your work, but it is so hard to get a good looking YouTube encode that a number of people would do anything to get that extra bit of quality. So 24p is great in that regard (with less frames to encode there are more bits to throw at each frame). There is also the chance that you could blow your 24p video up to 16mm or 35mm and show it in a theater. But when it comes to your DVD master, your workflow might put the 3:2 pulldown back into your source just before you burn the DVD. Your DVD authoring program might do this automatically when it encodes the disk image (it could be an encode option that you simply have no control over). No worries. You will still end up with a gorgeous film look if you follow the process I outlined (shoot 24p, then remove the 3:2 pulldown that Canon adds, then edit, then produce a 24p master, then burn the DVD with a tool which may put the pulldown back). The reason you need to get the 3:2 pulldown out of your source is that each edit splice could potentially screw up the frame cadence. You only want to cut on the true frame boundaries (the 24p boundaries) so as a result the 3:2 pulldown has to come out.